Anandamela 20 May 2016 ebook pdf file. All my little friends, now I brought an old edition of Anandamela, the edition is on 20 May 2016. 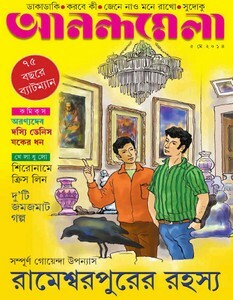 There are many notable topics in this issue like full detective novel- Rameswarpurer Rahasya by Paramita Ghosh, Story- One night in Shantiniketan by Krishna Basu etc.